In the first four days of April, the price of the MIBEL electricity market of Spain and Portugal was between 50 €/MWh and 60 €/MWh, remaining in the group of markets with the highest prices in Europe, with an increase of 22% in comparison with the average price of the first four days of last week. On April 1, the 7% tax on electricity generation came back into force, which according to AleaSoft will cause prices to increase between 2% and 5%. 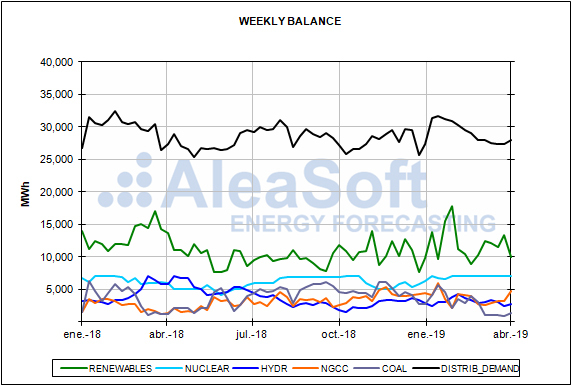 In addition, the drop in renewable energy production, both wind energy, which so far this week has been 48% lower in the Iberian Peninsula compared to last week, and solar energy, which has been 26% lower in Spain, together with an increase in electricity demand in the analysed period, favoured the increase in prices. At AleaSoft the quarter just ended was also analysed. The average price of the first quarter of the Spanish market was 54.97 €/MWh and that of the Portuguese market 55.56 €/MWh, in both cases 14% higher than in the first quarter of last year. The main reason for this growth is the increase in the prices of CO2 emission rights, which in the first quarter of last year were below 14 €/t, while in the first quarter of this year they were around 22 €/t. Iberian wind energy production decreased by 20% in year-on-year terms in the first quarter of the year, another factor that favoured the increase in prices. In the majority of European electricity markets, also affected by the increase in the price of CO2 emission rights, the price of the first quarter of this year increased compared to the first quarter of last year, from 7.8% of the EPEX SPOT market France to 21% of the Nord Pool market of the Nordic countries. The only market that registered a year-on-year decrease this quarter was the British N2EX with a reduction of 0.6%. 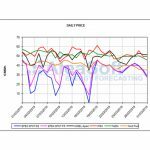 In the first days of April, European electricity markets continue divided into two groups according to their price, as it was already happening in March. 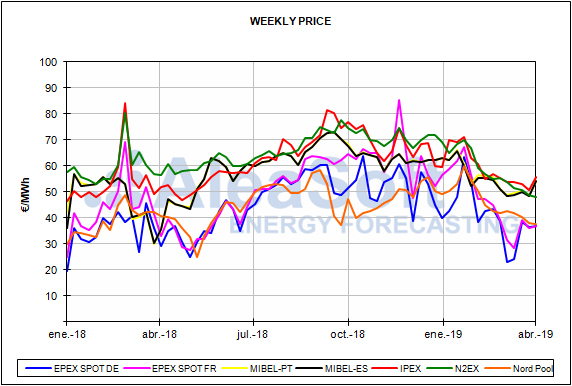 In the group of markets with higher prices, which this week are in a range between 50 €/MWh and 60 €/MWh, are the IPEX market of Italy and the Iberian MIBEL market. The N2EX market of Great Britain, which is usually in the group of markets with higher prices, this week is oscillating between the two groups, with prices between 45 €/MWh and 50 €/MWh. 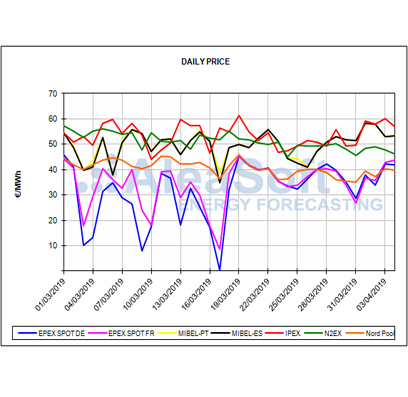 And in the group of markets with lower prices, which are in a range between 35 €/MWh and 45 €/MWh, there are the EPEX SPOT markets of Germany, France, Belgium and the Netherlands, and the Nord Pool market of the Nordic countries. 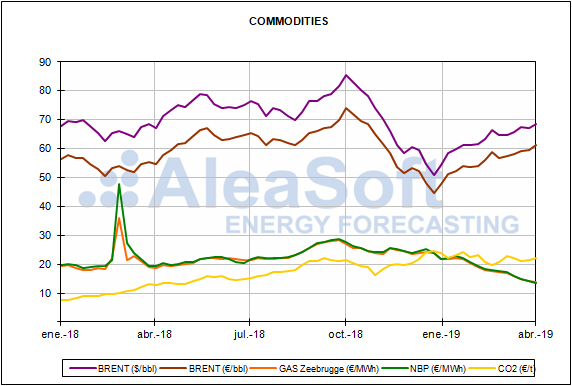 The price of Brent oil futures for the month of June in the ICE market continued to set annual highs this week of April 1, approaching the 70 $/bbl mark, as a result of supply cuts led by OPEP, the situation of political instability in Venezuela and the optimism about the trade talks between the United States and China. In the session of yesterday, April 3, it settled at 69.31 $/bbl. 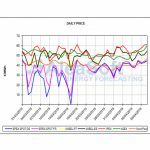 Analysing the whole of the first quarter of the year, Brent oil futures for June 2019 were relatively stable between 60 $/bbl and 62 $/bbl from the beginning of 2019 until mid-February. From mid-February to the end of the quarter, and also in the first days of April, they have maintained an upward trend favoured by the supply affectations explained above. The price of TTF gas futures for May in the ICE market was 14.19 €/MWh on Wednesday, April 3, 5.4% higher than the previous day. However, gas prices are expected to continue with the bearish trend they are experiencing since the beginning of October last year. The first quarter of this year, which is included in the period of falling prices, started at 20.59 €/MWh and ended at 14.24 €/MWh, with a decrease of 31% during the period. On the other hand, API 2 coal futures for May 2019 in the ICE market continue to fall, reaching 57.20 $/t yesterday, April 3, the minimum value of the last two years. 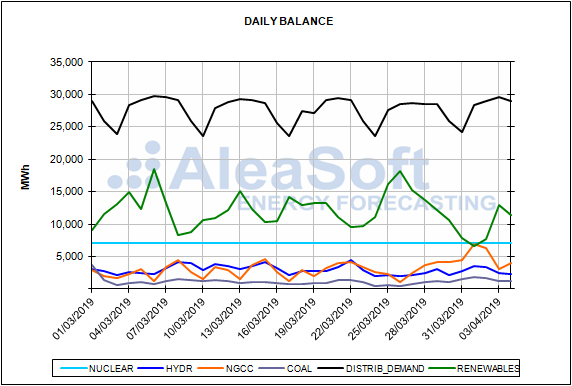 The first quarter of 2019 the price of this product began at 84.30 $/t and ended at 63.95 $/t, with a drop of 24%. At AleaSoft, the price is expected to continue with the bearish trend in the coming days. The prices of CO2 emission rights in the EEX market for the reference product of December 2019 settled at 23.16 €/t in the April 3 session. During the first three days of April prices had an upward trend. The evolution of the coming days and weeks will depend to a large extent on the Brexit negotiations. During the first quarter of 2019, futures prices of CO2 emission rights for December 2019 oscillated around the equilibrium value of 22 €/t. The minimum settlement price of the product in the quarter, of 19.22 €/t, was reached on February 21, and the maximum, of 25.65 €/t, on January 22. In the first quarter of this year there was a downward trend in the prices of the electricity futures markets of Spain in OMIP and EEX and of those of Portugal in OMIP. 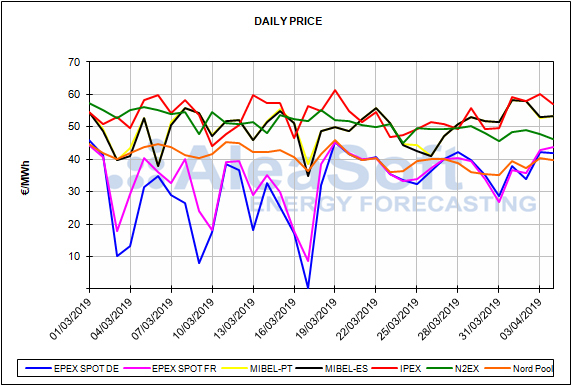 The May futures of these markets decreased by 16% between the session on January 2, when they settled around 59 €/MWh, and the last session in March, on the 29th, when they settled below 50 €/MWh. Since the beginning of April, the prices of this product have been around 50 €/MWh. The futures of Germany and France in the EEX market for May this year also maintained a downward trend in the first quarter of 2019, with a fall of 23% and 24%, respectively, between the first and the last sessions of the quarter. In the first three sessions of April, the trend continues to fall, settling yesterday, April 3, at 35.89 €/MWh for German futures and 34.86 €/MWh for France. In the first quarter of 2019, electricity demand in Spain was 2.8% lower than in the same quarter of the previous year. According to REE, the decrease was 2.1% once the effects of temperature and working patterns were corrected. During the first three days of this week from April 1, the electricity demand increased by 1.7% compared to similar days of last week, because temperatures dropped. Wind energy production in Spain in the first quarter of this year fell by 18% in year-on-year terms. During the current week it also fell compared to the values of last week, by 51%. 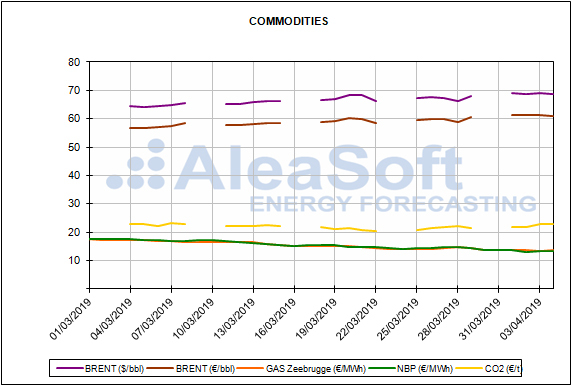 The AleaSoft’s forecasts indicate that next week, of April 8, the production with this technology will grow with respect to this week. In the just ended first quarter there was a year-on-year growth of solar energy production in Spain, both in photovoltaic, which grew by 26%, and in solar thermal, which grew by 57%. The increase in the total solar energy production in the first three months of 2019 was 35% compared to the same period last year. In the first three days of this week solar energy production dropped by 26% compared to the values of last week. 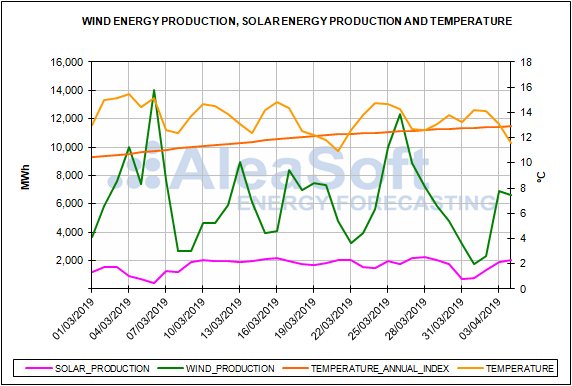 For the next week, at AleaSoft solar energy production is expected to be similar to this week, although as the sunshine hours increase, the trend will be to growth. Nuclear energy production increased by 6.4% in the first quarter of 2019 compared to the same quarter last year. Currently, all nuclear power plants are operating normally. Hydroelectric energy production fell by 24% in the first quarter of this year in year-on-year terms. In the first two days of April, production with this technology was above 80 GWh, but yesterday April 3 it dropped to 62 GWh. 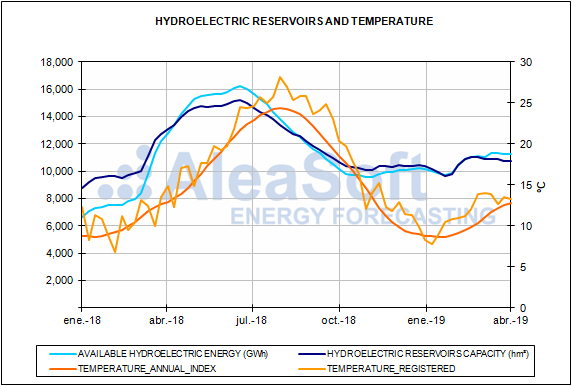 Hydroelectric reserves continue to fall this week, for the third consecutive week, and are currently at 11 118 GWh, representing 48% of total capacity, according to data published in the Hydrological Bulletin of the Ministry for Ecological Transition. The decrease with respect to the previous bulletin was 107 GWh. In the first quarter of this year, hydroelectric reserves were on average 28% higher than in the first quarter of 2018.